Previously, I wrote about how it will be difficult if not impossible for Donald Trump to adjust following a disastrous midterm and position himself for re-election. Today, I’m going to look in detail at what the midterms suggest about the challenges facing Trump in 2020. In my next post, I will consider the longterm implications of the 2018 results for the Republican Party. After that, I’ll look at how the Democratic Party is positioned for the future. This is a long essay, so if you’re interested in an executive summary, it’s this: the 2020 election will be decided in five rust belt states and five sun belt states. Democrats faltered in the rust belt two years ago but staged a comeback in the midterms. They fell short in the sun belt two years ago but showed signs of competitiveness which accelerated in the midterms. Republicans need to reverse the midterm results in the Midwest and keep the sun belt from tipping to the Democrats for at least one more cycle if they want to hold the White House in two years. This will require the insight, will and ability to make significant stylistic and policy changes to attract voters they lost this year without demoralizing their base, something neither the president nor his party are positioned to do. Donald Trump has consumed the Republican Party, re-created it in his image, and governed for his supporters and a tiny, elite class of wealthy donors. In the process, he has disregarded the rest of the country. Earlier this month, the rest of the country pushed back. No one should have been terribly surprised. Polling data made it clear that the base loves what Trump is selling and how he sells it, but they live on what I call Republican Island, where their preferences diverge from Democrats and a large share of independents. Majority disapproval, much of it strong, has persistently overshadowed high levels of devotion from the president’s base, stubbornly capping his overall performance scores in the mid-40 percent range. But because his strength is clustered among Republican voters who determine primary contests, and because he willingly acquiesced as president to the Republican congressional agenda he rejected as a candidate, Republican officials who want to realize their policy goals and preserve their careers have had no choice but to enable him. Because survival under these circumstances meant staving off pro-Trump primary challenges, worrying about a potentially hostile general electorate was a luxury. And it wasn’t like Republicans were without defenses or reasons for optimism about the midterms. It was reasonable to wonder if Democrats, as usual, would stay home, or if Republican attempts to dilute the opposition through legislative gerrymanders, voter ID laws, and other efforts at voter suppression would keep them in power. When Democratic turnout surged on November 6, it became clear that Republicans had a lot of repair work to do to position themselves for 2020. At least it should be clear. If Republicans want a different outcome in two years they should take a sober look at why almost as many people voted for Democrats in this lower turnout election as voted for Trump in 2016—and make adjustments. Donald Trump won the presidency by crashing through the Midwestern “blue wall” that had boosted Democrats since the election of Bill Clinton in 1992. Hillary Clinton is not in the White House today because she was unable to hold Pennsylvania, Michigan and Wisconsin, or keep Trump from sweeping historically red states in the South and mountain West, or prevent him from winning the swing states of Florida, North Carolina, Iowa and Ohio. 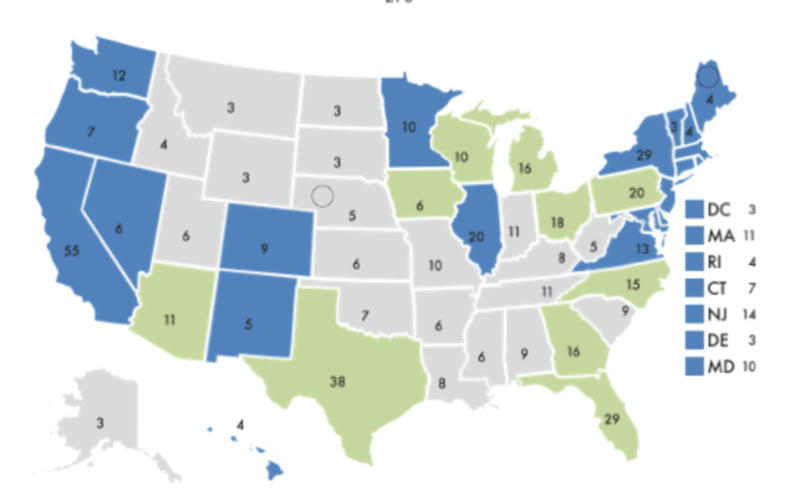 Trump’s only viable path back to the White House requires replicating this map, although he can lose two of the three blue wall states and still get to 270 if he again wins the swing states. Trump’s margins were extraordinarily narrow, but he held his own in suburban areas, turned out extremely large numbers of unlikely voters in white rural areas, and benefitted from depressed turnout in Democratic strongholds. Those white rural voters turned out again for him this month, but his support cratered in the suburbs and among independents, while Democrats really did metaphorically crawl over broken glass to vote. The result was a resounding reversal of what happened two years ago in the places Trump will most need to win two years from now. This makes the Midwest a key battleground, and a region where Trump can’t stand still if he hopes to win again. Negative reactions to the administration’s trade policies, concerns about health care, and the abandonment of suburban voters combined to boost the fortunes of Midwest Democrats this year. Their strongest showing was in Pennsylvania, Michigan and Wisconsin, where they went six-for-six in gubernatorial and senate races. Democrats also held a senate seat in Ohio and picked up two of three Republican House seats in Iowa, while losing close gubernatorial elections in both states. If the 2020 election is held under circumstances resembling those in place today, Trump would be favored only in Ohio, while Iowa would be close. Meanwhile, Democrats can be fairly confident of holding the states Hillary Clinton won. The Republican Party has been dead on the West coast for years, and following this month’s election is now virtually extinct in the Northeast. The numbers are brutal. Republicans will represent no more than eight of 53 California House districts in the new congress (one uncalled race could drop this figure to seven). Susan Collins is the only Republican representing the six New England states in either the House or the Senate, and she survives only because she was not up for re-election this year. Only one Republican represents New Jersey, only six represent New York. Meanwhile, Virginia, Colorado and Nevada are turning various shades of blue, and while all three will be contested in 2020, recent voting patterns coupled with the 2018 results suggest it will take a stumble by the Democratic candidate rather than a strategic move by Republicans to pick them off. This gives Democrats 20 core states plus the District of Columbia with a total of 233 electoral votes, just 37 shy of victory. That’s where things start to get interesting. A second electoral front has opened across the sun belt, and the 2018 results suggest up to four historically red states plus the perennial battleground of Florida could be contested and in play. For years, we have been watching dramatic changes to the demography of the southern half of the country, with once solid red states becoming purple and then light blue with the influx and growth of a multicultural and younger electorate. Virginia, Colorado and Nevada, all reliably red until 2004, were the first to flip. North Carolina and Georgia have reached the toss-up stage and would already be comfortably within reach for Democrats if not for blatant and extensive efforts by Republicans to disenfranchise Democratic voters. Barack Obama actually won North Carolina—barely—in 2008 and Clinton came with five points of Trump in Georgia, better than her showing in Ohio. Arizona, the ancestral home of Barry Goldwater where Clinton finished only three-and-a-half points back, just elected a Democratic senator for the first time in almost thirty years. And of course there’s Texas, a majority-minority state that Democrats have coveted forever, where Beto O’Rourke just came within two-and-a-half points of unseating Ted Cruz. The Clinton campaign was hurt by underperformance in the Midwest at a moment when Democrats had not quite become competitive in the sun belt. Consequently, she couldn’t trade Georgia for Michigan or Arizona for Wisconsin. But that moment is fading. Arizona is positioned to be the next red-to-blue state, with North Carolina and Georgia close behind. The big prize of course is Texas, and although it’s likely to be the last of the sun belt states to become competitive, O’Rourke showed Democrats how to make it happen, just as Stacey Abrams demonstrated how to compete in Georgia: embrace and articulate progressive values and show up in places previous candidates ignored. Run a campaign of mobilization and persuasion by motivating the base and making your case to independent voters and non-Trump Republicans. Both O’Rourke and Abrams fell short, but they came much closer than recent candidates and the demography of the sun belt will continue to move in the Democrats’ direction. Democrats should make a serious play for Texas in 2020, but whether or not they do, the fact that they can has to be unnerving for Republicans. Remember, Democrats need to add 37 electoral votes to their base states for an Electoral College majority. Texas has 38. With Democrats ascendant in portions of the sun belt and rebounding in the Midwest, Republicans will need to reposition themselves if they hope to replicate their stunning 2016 performance. They have succeeded in motivating young people and people of color to vote against them by historic margins. They have repulsed educated white women and lost suburbs outside the deep South. Their margins are down with older white voters fearful of the party’s relentless attempts to undermine health care and with Midwesterners hurt by Trump’s trade policies. In style and substance, Trump Republicans are pushing away a majority of the electorate. Trump has managed to hold and turn out his base, especially high school educated white men and southern white Evangelicals. But this is at best a mixed blessing. Recent presidents who found themselves on the losing end of a midterm wave were hurt because their supporters didn’t turn out, and were able to find their way back to relevance in part by rekindling things with their base. Trump didn’t experience this fate. His voters turned out this month but their numbers were insufficient to save Republicans. They stand to be even more outnumbered in a presidential electorate. Republicans can’t stand still if they want to avoid another blue wave in two years. Yet how do they change? Trump will continue to be who he is and use the presidency to feed his ego and security needs, in the process using his anger to channel and validate the grievances of his supporters. He will take every opportunity to pick a fight with Nancy Pelosi, soon to be the highest profile Democrat in Washington, and with his eventual Democratic challenger. But this is a mobilization strategy for supporters who are already engaged, not an effort to reach voters who want a lot less nationalism, a lot more stability, and policies resembling the economic populism Trump advocated as a candidate and abandoned as president. In other words, the voters he needs to be re-elected. I am not suggesting that the outcome in two years is preordained. Things we cannot anticipate will define the upcoming campaign season. We don’t know what turn the Democratic nomination process will take, or how Democrats will use their newfound congressional power. We can’t predict economic conditions over the next two years, and it always feels like we’re about ten minutes away from a constitutional crisis. Robert Mueller continues to hover over everything. Donald Trump could well face a primary challenge from a Republican-in-exile, or someone could decide to plunk himself into the general election as an independent candidate, scrambling the electoral math. There’s even a possibility that Donald Trump will be out of the White House before the next election. We don’t know. But with the dust settling on the midterms, it’s clear that Republicans need to make significant changes to extract themselves from a political trap of their own design, and it is equally clear there is no easy way out.